Designed for advanced ergonomics, the Advantage2 Silver Contoured USB Keyboard by Kinesis is your go-to when trying to reduce repetitive stress injuries at work. It's contoured to fit the natural position of the wrists and hands, banishing the old way of awkward typing. With traditional QWERTY layout or the newer Dvorak layout, you can type comfortably, your way. This model comes upgraded with a silver gloss finish, making it a stylish and practical addition to your workspace. How would you like to eliminate repetitive keystrokes? 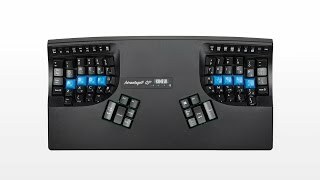 The Advantage2 Keyboard offers the advantage of programmable macros. You can add over one hundred macros to your keyboard, with 2 MB of onboard memory. And your keyboard will never get left behind with firmware upgrades made available to you in the SmartSet engine. The keys on the Advantage2 Silver Keyboard provide a satisfying keystroke, and the gray home row keys can be swapped out for Kinesis blue key caps. For most users, this premium, elegant pedal provides more comfort than the outer pedals of the triple action model. The pedal is front-hinged with a textured surface, and can work with any model of Kinesis contoured keyboard. If the user desires, a self-adhesive hook-and-loop tab is included to anchor the foot pedal to the floor. The triple action pedal is the best and most efficient way of taking advantage of your Kinesis Advantage2 Contoured Keyboard's foot input options. It can be configured to perform any user-defined macro or keystroke. Have been using for ten years, our staff are all using them. The new boards have more spring to them, quicker in typing, very helpful. A great purchase, even though pricey, worth the investment. There is no problem with the product, it helps me a lot in the ways I needed it to. The problem was that with all taxes and transports I eventually paid ?549 for it. Thats just a ridiculous amount to pay for a keyboard, even one such as this. I also don't like where you put the letter Ĺ. It makes no sense. Having used a lot of different keyboards, split, laptop, full, qwerty, dvorak, and so on, I'd say this one is the hardest to get used to out of the gates. Even now, the space, backspace, enter, and delete keys are fairly hard to get used to. Also, as a computer programmer, the arrow key placement is quite hard to get used to, along with the brackets, tilde, plus/equals key, and the slash/vertical pipe key. After using it a while, I'm somewhat thinking that this keyboard needs a program of some kind oriented around getting comfortable to the key placement. Also, getting used to hitting the right numbers is odd. I think it has something to do with the keys normally being offset some horizontally, instead of in exact columns up/down. Home row f and j keys do not have the typical raised dots on them, making finding the homerow by brail harder. Hitting the Function keys (F1-F12) is also harder to hit accurately as they are quite a bit smaller. As often as I hit some of the control keys like scroll lock, program, print screen, I might have rathered to have them centered in the very middle of the keyboard, and make the function keys normal sized. Also, the rubber function buttons are very easy to press, sometimes making it almost too easy to hit the wrong one. Having to press control/alt with your thumbs is also interesting. Any key combination of control/alt some key on the left side gets to be odd to strike. I end up holding both control/alt down by pressing across them sloppily with my left thumb, and pressing the key with one of the other four left fingers. The feel of the keyboard is a nice quality. The gel pads were an unexpected, and nice addition to the keyboard. It would be a tiny bit nicer, if the keys were maybe 5%-15% easier to strike, but perhaps that's just my arthritis acting up. When the keyboard shipped, I was playing with the different reprogramming settings and I noticed the control key on the right side didn't work out like I expected. If you are used to using 10 key, you might be happier with a separate 10 key unit, as the function lock to use num pad is somewhat sub-par for frequent use. If you have a long session it might be worth using, but for short bits, I end up using the top row of numbers. My accuracy dropped with this keyboard quite a bit at first. If you want to try out this keyboard, be sure to do it when you do not have a lot of pressure behind you to produce a lot of work quickly. I came from using a split key before, but, even so, it's quite different. Overall, I'd have to say I like the keyboard, and hope to use the macro features more, and someday re-enable the dvorak (I used to use that before, and it felt the most comfortable due to the better alternating of hands). I do not particularly care for the silver color. White, black, or even blue might have been better. For the price people pay, it might not be a bad service to offer to recolor it for customers for a small additional price. The slick finish does make it easy to wipe down and keep the non-keyed areas clean. We will see how it goes, but so far I'm not displeased with my purchase, but I don't know anyone who uses their computer enough that I could honestly say it would be a recommended buy. I have had a kinesis keyboard for 10 years now and absolutely love it. The new ones are great and carry the same quality kinesis is known for. I have even ordered the dvorak keys direct from kinesis for a keyboard that will last me another 10 yrs. It took some practice to get used to the concave, non-staggered layout. And the thumb keys also needed some getting used to. But after going through the typing exercises as instructed in the included booklet, I became reasonably proficient at typing on the keyboard and noticed that I seemed to extend my fingers much less than on a regular keyboard. While keys line up into columns, they are staggered row-wise and vary in depth to match the different lengths of the fingers. As for the foot switch, I ended up purchasing two more foot switches and a signal splitter directly from Kinesis. I have remapped them to function as Shift, Control, and Alt keys. The setup seems to be working so far and I hope to get to a point where using these will be as natural as typing with my fingers. I use vi frequently so I've remapped the Left Control key to function as ESC key as the ESC and function keys are small and far from the home row. This has worked out well so far as I can hit ESC much quicker and without looking compared to a standard keyboard. It's true that I could have configured vi instead, but this seems more useful. The keyboard is able to use Dvorak layout but I have not tried this feature yet. Another feature I haven't tried yet is macros, but storing and recalling frequently used snippets/key sequences seem very useful. Overall, I love this keyboard for its ergonomic design and that it is so configurable. The only frequently used keys I still can't touch type with consistency are the arrow keys and the bracket keys. They are in the bottommost row (two rows below the home row) and I find them hard to hit with confidence. $359.00 List Price: $389.00* The list price is the same as the MSRP (Manufacturer's Suggested Retail Price). It may not necessarily be the price at which the product is sold.